Welcome to our first Members Update! There has been a lot going on since we launched The Cyclone last month, and we can’t wait to share some of our activities with you. 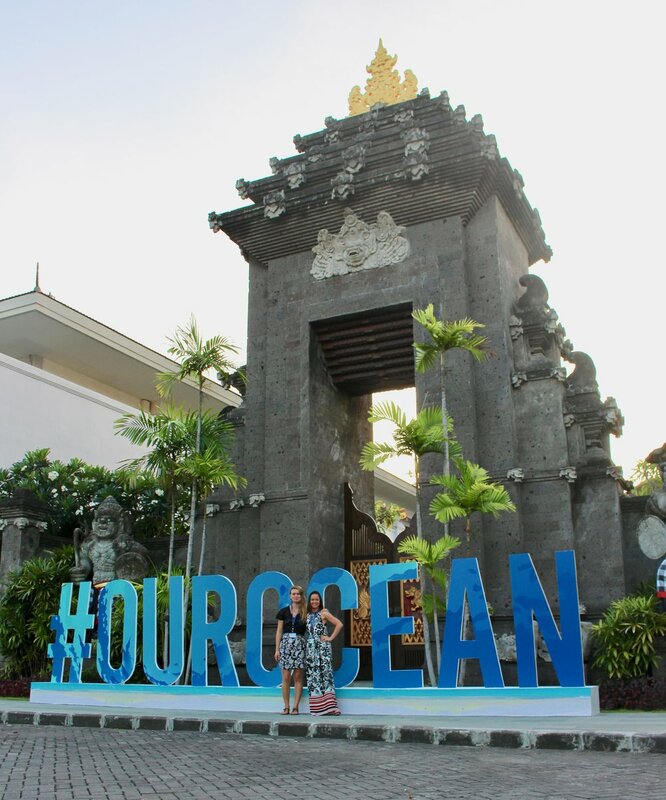 A few weeks ago members of the Manta Team attended the fifth ‘Our Ocean’ conference in Bali, Indonesia. Our Head of Conservation Strategy, Isabel Ender, offers some insight into what the whole event was about, and why so many people from around the world descended on the island of the gods. At the fifth Our Ocean conference, stakeholders from around the globe convened to generate commitments and take actions for the sustainability of our oceans. Participants included governments, commercial sectors, financing entities, scientific communities, civil society organizations, and young leaders. Heads of States, Ministers, and champions from various backgrounds were also invited. Our Ocean aims to foster collaboration and partnership between ocean stakeholders, which is translated into concrete and actionable commitments. 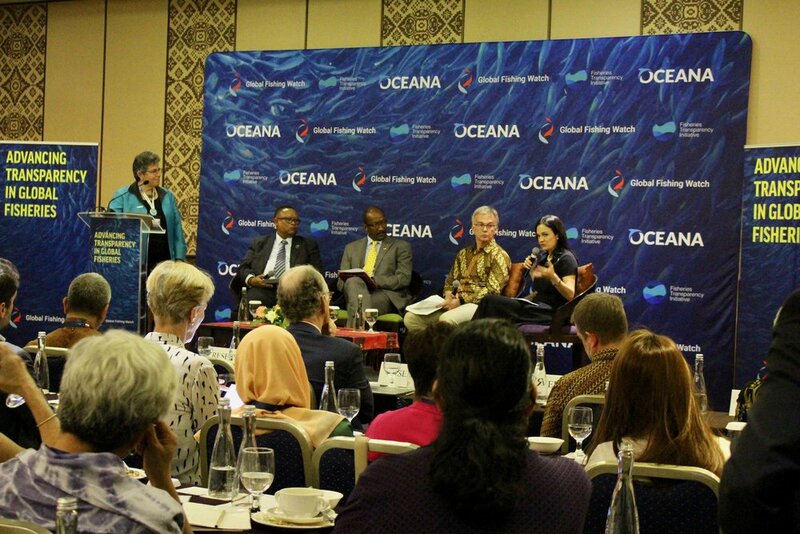 Discussions this year focused on the issue of marine pollution, in particular plastics, sustainable fisheries, climate change-related impacts to the ocean, marine protected areas, and the cross-cutting themes of maritime security and blue economy. Over 280 tangible commitments with a value more than US$10 billion were made, and 14 million square km in new Marine Protected Areas were pledged! Isabel Ender with ‘Her Deepness’, Sylvia Earle. Photo by Betty Laglbauer. It was such an honour to participate at Our Ocean 2018, on behalf of Manta Trust, learn more about these issues and the true scale of problems, yet also be inspired by the incredible actions and investments that are being made to combat ocean threats. Most memorable to me was the enthusiasm that shined through the young ocean leaders. Seeing how engaged and committed the new generation is to literally “clean up the mess we made” left me humbled, inspired, and full of hope. The Manta Trust network extends across the world, and is made up of dozens of passionate individuals, working to understand and conserve the manta and devil rays that share their corner of the ocean. 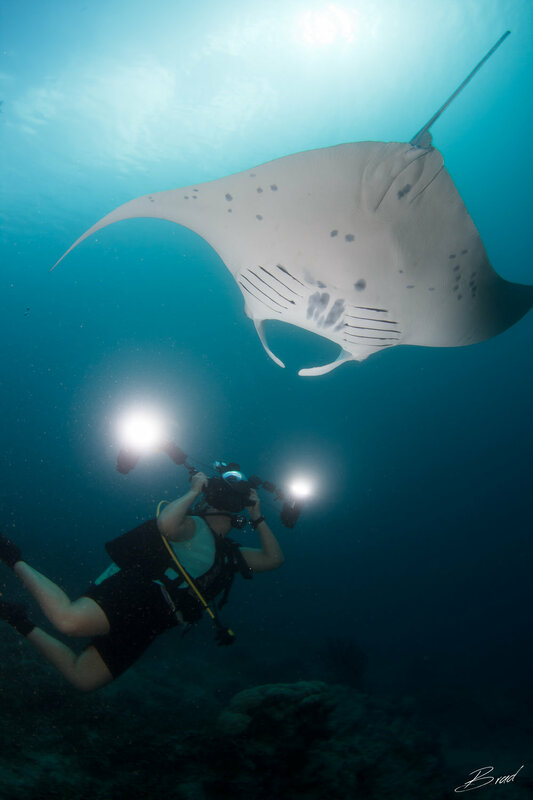 We want to introduce you to the people that make up the Manta Team, and we’re kicking off our inaugural ‘Meet the Team’ feature with Guam-based manta biologist, and the Founder/Director of the Micronesian Conservation Coalition, Julie Hartup! Julie mid-way through taking the perfect ID photo! Photo by Brad Holland. Tell us about your first manta ray encounter. I had my first manta ray encounter 23 years ago in Grand Cayman as a fresh new scuba instructor. My dive partner was busy taking a picture of a critter in the coral, when I saw this huge majestic flying water bird coming my way. I was frozen in awe at its beauty, grace, and strength. As it was about to pass by, I thought to tap my dive partner. It will be an experience I will never forget and continue to feel with every interaction I have, be it with one or 50 manta rays. How did you come to start researching manta rays? I had moved to Guam with my family and decided to go back to school for my Masters degree in marine biology. I had been to Yap, an island near Guam, to dive with manta rays. It was in Yap diving with these majestic animals, seeing their social interactions with each other and with divers, that I decided I wanted to know more about them. Within the several months following that experience I was enrolled at the University of Guam, and decided to specifically study manta rays. I’ve been studying the different populations across Micronesia ever since. What is the most surprising thing you have learnt about manta rays? The most surprising thing for me is just how social manta rays are. A lot of past research suggested that manta rays are solitary animals, yet my experience studying them has shown quite the opposite. These species interact with one another in a very complex, hierarchical, and social way. Some individuals always seem to hang-out together more often than what you would expect by chance, and to me that’s absolutely fascinating. Manta rays are elusive and cryptic. Even though we have sites they often visit, one of the most challenging parts is documenting manta rays not just at feeding or cleaning stations, but during other parts of their lives - especially in the open ocean. Satellite tags are expensive, and often only give us a small time frame to peak into their lives. So it’s challenging to study and document these elusive periods of manta ray life. What legacy would you like to leave in your field of research? Manta research has focused in areas that have large populations, but after studying the micro-populations in Yap and Guam it has become clear that we can learn new information about these animals specifically by comparing the differences between small and large populations. Studying these smaller populations can answer questions and bring to light new information about manta ray ecology. To give you an example, we documented Guam’s manta rays targeting reef fish spawning aggregations, to feed off of the spawn being released. However, mantas in other parts of the world don’t seem very interested in fish spawn. This targeted feeding behaviour might change between different populations depending on the levels of productivity in the water. By studying the feeding behaviour of manta rays in different populations, we can better understand the flexibility of a manta’s diet based on what and how much food is available. If you could ask people to do one thing to help - what would it be? Getting involved with citizen science, especially as a SCUBA diver, has always been a great help to our research. However, the biggest thing people can do to help is donate directly to research. 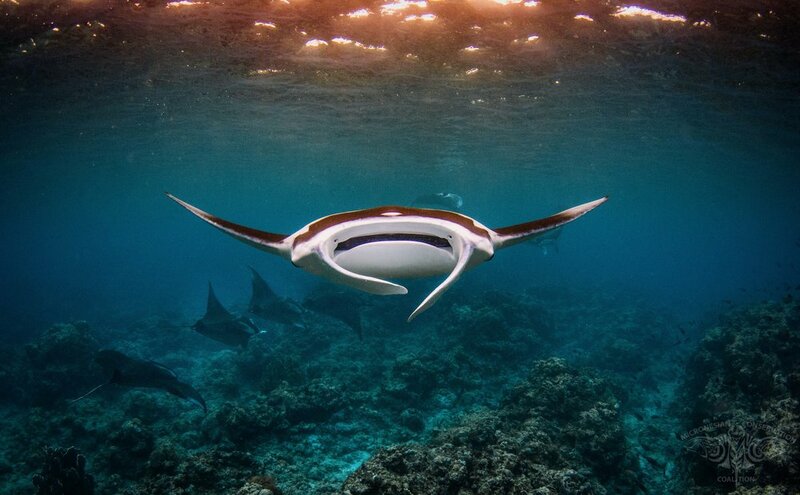 The number of governmental or private-sector grants for manta ray projects is small and often very competitive. Many projects worthy of funding never take off. My advice to people who want to help is to pick a project, a place, or even a particular species, that has some meaning to you, and help the specific scientists unleash the secrets of these amazing animals. Thank you for being a part of The Cyclone community. Without you and your support, much of our projects and upcoming conservation efforts wouldn’t be possible. We invite you to comment below about anything we’ve discussed in this Member Update, or about manta rays and our work more generally. Otherwise, we look forward to sharing more of our activities with you soon.